More than a month ago, I created a Facebook page called “Dinge, die ein Politikstudent nicht sagt” (>3 500 fans), following the example of its successful English Version “Things Politics students don’t say” (>6 000 fans). The money is in studying Politics, you end up poor if you do Economics. I have finally found a simple definition of politics that everyone can agree on! My parents were so happy when I studied this instead of law. As it is with all things, they’re funniest when they’re true. To anyone who has just finished his A-Levels, look for these pages on Facebook, relevant to your desired program. They will tell you more about your next three years in college studying – let’s say – politics than any student counselor. When I first started studying Politics back in 2009, Facebook was not as popular in Germany as it is today. As there was nobody to truly tell me how it would be like to study what I had always had an interest in, I was left with my intuition, people’s opinions and experiences about studying Politics and my parents’ disapproval. I dived in naively, not knowing the relatively unstable job market for political scientists-to-be. While it is true that most political scientists find Jobs within federal governments, think tanks, nonprofit organizations, colleges and universities, political lobbying groups, and labor organizations. Now, three years later, I cannot stress enough that getting a job is highly dependent on one’s own efforts and luck to become a good job candidate. I now understood why my parents were not particularly keen on seeing me sign up for three, and most likely, five years of studying Political Science. In 2011 within just a few months, “pretty stable” regimes collapsed, Japan’s nuclear catastrophe irreversibly changed Germany’s energy policy and Denmark returned to its infamous border controls. Nothing seemed safe, everything was unpredictable. Questions were asked, answers were needed. The more complex the news, the more necessary became those who could explain them: political scientists turned into overnight celebrities. What they were taught are what they can do best: organize chaos, explain mysteries, foresee hindrance. Explain the world. Luckily, my parents now, too, understand. The ever growing number of online freedom fighters has been an issue since the advent of the notorious Kony campaign by Invisible Children. At first impression, you must be wondering why it would even be an issue. Why would the increase in conscious citizens using Twitter to tackle real world issues be an issue? Romance. Freedom fighting has often been romanticised as something heroic and courageous, filled with grit and bloodshed, something noble. The camaraderie, the union of men and women bound by oppression and fighting for a single ideal, freedom. Now this may be a cinematic description of what the Syrian rebels or PKK soldiers may be doing but nonetheless it paints a picture that does not exist. Now I do not doubt nor am I talking ill of those around the world in these political positions – however the fusion of the Internet and the romance of anti-establishment has created a new battleground for these online Guevara-influenced guerillas. Social media was at the forefront of the Arab Spring and the ones I speak of bear no resemblance to them. I am talking about those who tweet excerpts of The 48 Laws of Power, nationalistic views and the odd picture of Karl Marx or Fidel Castro smoking a cigar with an abstract comment like “the ashes fall like my comrades in battle”. For the readers who get the impression I am a right wing nut with a disdain for anything red or left – no, I am quite the opposite. I was born and bred in London to Kurdish refugee parents. I’ve been submerged in politics, completely out of my control, since I can remember. Now rather than parade what I believe in and what I have learnt, the point I am making is that these armchair activists take themselves too seriously and honestly believe they are waging a necessary war via the Internet. One click of a hashtag on Twitter and you are sent into a warzone of regurgitated facts and angry polemicists seemingly trying to build a nation with 140 characters. The romance of it attracts the superficial ones. Some do like being oppressed, most may not know it but they are driven by it, they like fighting for a cause and without it, feel redundant. So what do they do? They fight fire with fire. An endless war that they initially tried to end by taking up arms online and as a result they unknowingly become a victim of their own circumstance. The oppressed and oppressors are no different in this case, just two sides of the same coin. For people who are supposed to believe in the welfare of mankind and basic human rights, they are very quick to incite violence on their oppressors or those who disagree with them. Now I get the same response over and over: “They’re raising awareness, it counts for something”. Yes it does but where does awareness end and action begin? The internet is a great tool and a great tool must be utilised, it is not intended to just add ease. It is easy to tweet a 140 character war cry from your armchair. However, I am not suggesting you get the next flight to Tibet and spearhead an independence movement. My intention is for you to be critical of superficial tendencies that get in the way of something so integral as peace and safety for your neighbour. There is an undeniable romantic appeal towards freedom fighters and anti-establishment. As a result, people become so concerned with the supposed flashy and glamourous life of a guerilla. They do not act like thinkers and builders on Twitter. They act like the very same soldiers they “fight” against. Thus the internet is another battlefield and everyone is equipped with weapons ranging from Twitter to Facebook. People need to understand that the revolution will not be Youtube-d. Actually, it already has. In the period after World War II a number of artists emerged in Beirut, a fulcrum between oriental and occidental, most famously Fairuz, Sabah, Wadih El Safi, Majida El Roumi, Nasi Shemseddine, Ziad Rahbani and Marcel Khalifa. Since then, Lebanese music has established itself as a symbol and leader of Arabic music. Today’s stars such as Najwa Karam, Diana Haddad, Nancy Ajram, Haifa Wehbe, Wael Kfoury, Assi El Helani, Fadhel Shaker and Elissa have become household names in many countries around the world. But when exploring a country’s music, attention must not only be paid to its singers but also to its instruments. Lebanon’s traditional music incorporates the deep and mellow sounds of the Oud, the beautifully decorated Derbakki (a kind of drum also known as the Tabla) and the Deff (also known as the Riqq, corresponding to the English tambourine). But if you really want to know all about Lebanese music, you will need to dance. Dabke is the national dance and the Lebanese people take particular pride in their skills in dabke dancing. Comparable to the Irish step dance or the Greek Hassapiko, songs such as Nasri Shemseddine’s ‘Ala Ali El Dar’ have the perfect beat. Wadih El-Safi’s and Sabah’s songs had distinct nationalist tones, reflecting the fact that many Lebanese were among the first Arab nationalists, particularly within the field of music. Mohammed Falafel, a servant of the Ottoman Empire in World War I, composed songs that became the anthems of many Arabic nations. From the very beginning, nationalism and music have been intertwined in Lebanon – the Rahbani Brothers and Fairuz are two other acts that should be mentioned here. Fairuz is one of the most famous Lebanese singers. After World War I, Lebanon was occupied by France until 1946. Following independence, many Lebanese artists emerged in the 1950s and 1960s, carrying on a tradition that was born under the French mandate. Mixing Western and Oriental music styles and instruments, the Rahbani Brothers popularized local folk music and made Lebanese music a highly distinguishable and unique genre. In the early 1970s, Fairuz also performed more Western songs, with lyrics that were closer to European traditions such as ‘Habaytak Bi-Sayf‘ (which means ‘I loved you in Summer’), which catapulted her to fame in the West. Another favourite is Samira Tawfik’s ‘Balla Tsoubou Hal Kahwa‘, which is literally about drinking coffee and adding more cardamom to it. The 70s not only produced these gems but also singers, if you will, like the Bandaly Family with their infamous ‘Do you love me?‘. Bear in mind that this was shortly before the Lebanese Civil War in 1975 began. Mashrou’ Leila make Arabic alternative music. In the landscape of post-civil war Beirut, there was a vacuum that needed to be filled, and around 1993, peace began to feel like a possibility for the first generation of post-war youth who were eager for change. Lebanon is surely not stuck in its past and it is thus one of the few Arabic countries which has an actual alternative genre to its rich traditional music, with artists such as the rappers Ashekman or Rayess Bek and alternative bands like Mashrou’ Leila or Youmna Saba. 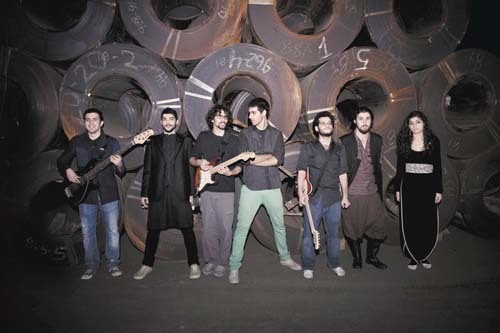 Seminal electro-Arabic fusion bands such as Soap Kills are considered to be the voice of an entire generation. Sounds derived from the production influences of Massive Attack and Portishead, Beirutian music has always been interpreted anew. But Beirut is a complicated place. On July 12th 2006, Israel launched an offensive attack. After 33 days of heavy bombardment, Beirut’s alternative scene suffered greatly. Its political instability however is not characteristic of its population. Not only did Lebanese music never cease to exist, but it was always subject to experimentation and innovation. Unlike in many countries of the West, where there always has been a clear line between music and politics, when in Beirut, one finds the two intertwined. Maybe this is the only place where musicologists also have to be good historians too. This article has originally been written for Your Middle East. Here is the link to the original article. My job and interest require me to read a lot on Iraq. As the 10th anniversary of the war came and went, concluding, apologetic and criticising articles, essays, opinions and let’s-take-a-look-at-what-we’ve-done-heres dominated the internet press. I read so many of them, I’d dare to say that I read them all. But if our conscience doesn’t have an answer, what can possibly tell us if we’ve done right or wrong? How do we measure its worth – the success of a war? We measure success by our own motives, more concretely: we compare the current outcome to goals which we’ve set at the very starting point and then we take a look at how similar they are. A lot of people waged the Iraq War and they had many motives, too. Some were known, others not so much. But that is collateral, in this post. To fully grasp the responses to the 10th anniversary, I took the liberty to divide them into two motives groups: (1) Bush administration and defenders and (2) Bush administration critics. Group (1), as Rubin already stated, was surprisingly silent. You might ask, what could they possibly say? Critics certainly outweigh the defenders, that means, the war must have been wrong, right? I don’t know. I was born in Iraq, I grew up there until I was ten, and I still have family left in the northern autonomous region, Kurdistan. I can’t tell you if it was worth it, unnecessary or – especially because I’m Kurdish – an act of liberation or not. Maybe I’m speechless because I don’t think wars are ever worth it, necessary or liberating, because I had no authority, power or enough information to wage this war, on any side of the equation, and unlike authors of all the articles I gave you to read, I didn’t have a motive. In my four years of studying Political Science, I found it troubling that so many people can have such big opinions, regardless of their expertise. But this is exactly why I loved studying it so meticulously: reading the news is like reading the psychology of politics.